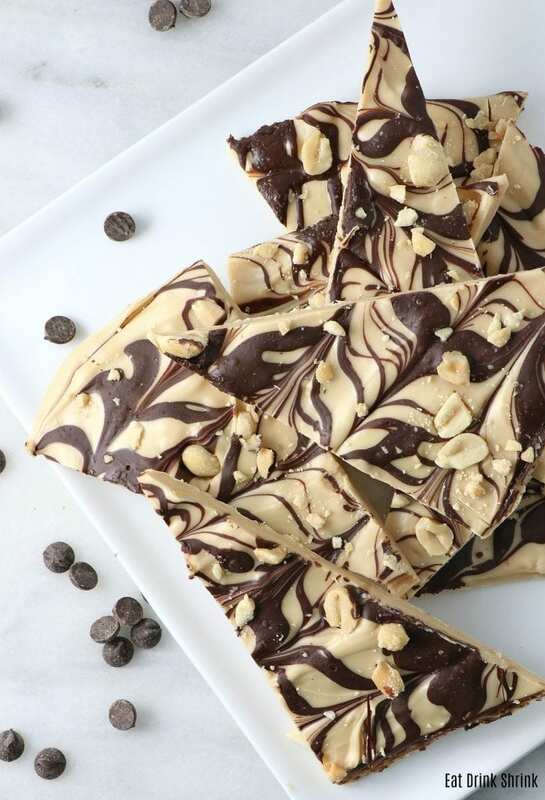 5 Ingredient Vegan White Chocolate Peanut Butter Bark - Eat. Drink. Shrink. Out of all the flavors there are to work with, there is one I rarely use.. While I don’t have an affinity for peanut butter, I love it combined with white chocolate. 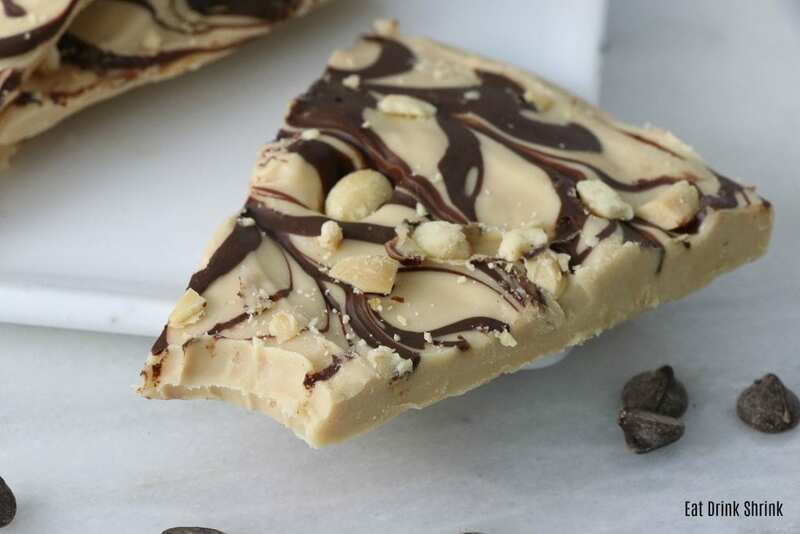 That being said, the White Chocolate Peanut Butter Bark was a no brainer! What I love about this concept is, everything! Like all chocolate barks, it’s easy, affordable, has minimal ingredients, minimal steps, has texture with the peanuts, tastes like a Reese’s Peanut Butter Cup, perf for any season, perf for a gift, and non vegan approved! 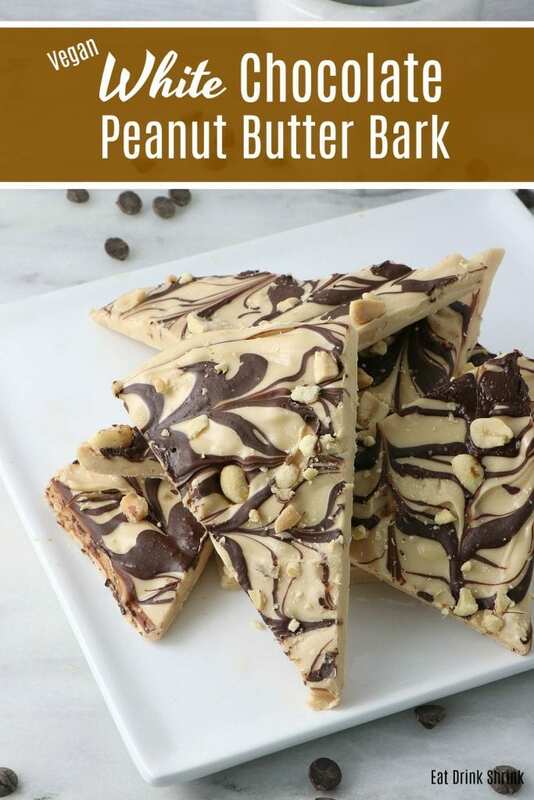 If you love all things peanut butter or chocolate or simply love effortless vegan desserts, you have to try my recipe for vegan White Chocolate Peanut Butter Bark! Combine the vegan white chocolate, peanut butter and coconut oil in a large microwave safe bowl. Heat for 1 minute, removing and combining every 10-15 seconds until fully combined. Combine chocolate chips and the remaining coconut oil and repeat the process. On a baking sheet lined with parchment paper layer all of the white chocolate/peanut butter down, smoothing out to achieve an even layer. Drizzle the white chocolate over the top in rows. You can make them defined for a clean look or mine more of a drizzly look. Take a knife or a toothpick and go back and forth to make swirls. Set aside to cool. Chop into triangles. Store in the fridge covered until ready to serve. If you want, omit the coconut oil from the white chocolate peanut butter bowl as the chocolate should still melt sufficiently. Also, don't overdo it with the peanut butter as it will make the chocolate too soft.